I believe these two things are very related. I don’t know about you, but if I was constantly being dragged or pushed around, my protests would get increasingly violent too. We see it all the time, and the truth is, we do it all the time. I am not exempt, though I am a lot better than I used to be. These days, every time I do resort to dragging or pushing a horse to where I need it to be, you can rest assured that A) I am stressed or tired, and B) I feel horrible about it after the fact. Because the crux of it is, it doesn’t do either our horse or ourselves any favours. 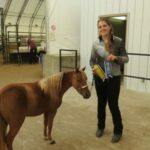 Every time we physically force a Miniature Horse to do something, we take away their agency and undermine their trust in us. We make the task we’re trying to accomplish more difficult next time, as now we’ve made it an unpleasant experience for them. And every time we meet force with more force, we’re teaching our horse that’s the way we’d like to communicate with them. Once you start looking for people pushing Miniature Horses around, you’ll see it everywhere. The champion winning trainer getting their horse in position for a win photo by grabbing their opposite hip and pulling them off balance. The youth exhibitor attempting to get their horse to sidepass in an obstacle class by shoving against their horse’s ribs. The family at the auction mart loading their new acquisition by dragging them into the trailer. 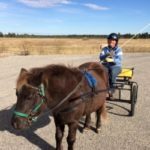 Not only is it not fair to the Miniature Horse, but using brute force to move a flight animal is going to create a lot of fear. 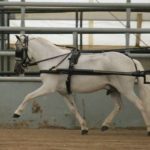 Horses need to have control over their own feet to feel safe, and when you take away their ability to move under their own power by physically moving them to where you need them to be, you’re creating a lot of stress. A horse under stress cannot learn. 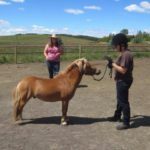 You might get done what you needed to, whether it was getting them on the trailer, or over a tarp, or into whatever position you wanted them in, but you’ve set back their training, understanding and trust dramatically. There are so many better ways. 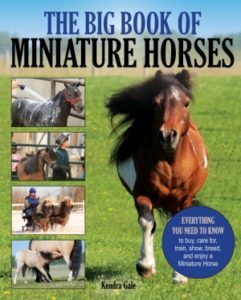 We need to stop manhandling our Miniature Horses. We can do better. Great observations! So true. Humans go to hand control first but not necessarily the best way for horses.